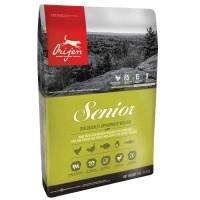 Senior dogs are best fed a diet rich in meat proteins to support lean muscle mass yet low in carbohydrates which can lead to obesity and diabetes. 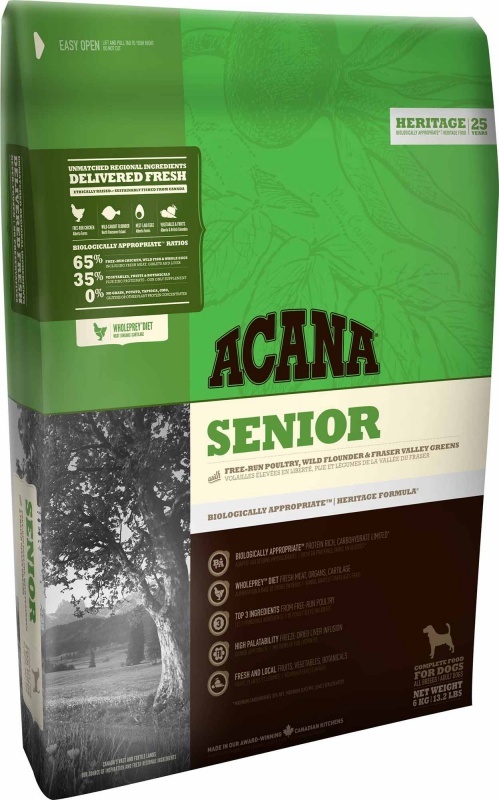 That's why ACANA Senior is rich in meat protein from local free-run Cobb chicken and whole eggs wild-caught flounder from Vancouver Island and Okanagan fruits and vegetables - all delivered fresh each day. 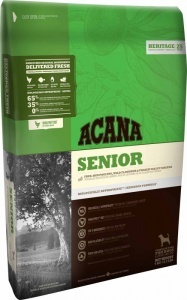 Carbohydrates reduced ACANA Senior features local steel-cut oats as a low glycemic single source of grain.Prepared from Canada's best and freshest ingredients, ACANA SENIOR dog food is a delicious way to keep your senior dog happy healthy and strong. 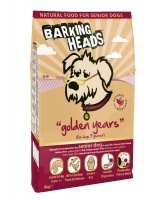 Fresh chicken meat (16%); chicken meal (15%); turkey meal (14%); red lentils; whole green peas; fresh chicken giblets (liver; heart; kidney) (4%); herring meal (4%); pea fiber; fresh whole eggs (4%); fresh whole flounder (4%); herring oil (2%); sun-cured alfalfa (2%); field beans (2%); green lentils; whole yellow peas; chicken fat (1%); chicken cartilage (1%); dried brown kelp; fresh whole pumpkin; fresh whole butternut squash; fresh whole parsnips; fresh kale; fresh spinach; fresh mustard greens; fresh turnip greens; fresh whole carrots; fresh red delicious apples; fresh Bartlett pears; freeze-dried chicken liver; freeze-dried turkey liver; fresh whole cranberries; fresh whole blueberries; chicory root; turmeric; milk thistle; burdock root; lavender; marshmallow root; rose hips; enterococcus faecium.